Pleaseth to my dear sister I recommend my best wishes and kindness to you. Lately I have just come from the Execution of her Grace, the Queen Anne and I bring you the news of these unjustly events. For the lady’s sake I found no favour in her sad and unhappy end yet not so great grief was shewed by others whose face and voices were twisted by malice to resemble hideous gargoyles. 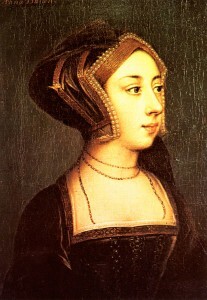 Myself I recall her as a young maid, not without demerits, but well favoured in face and some sweetness, yet who by evil cunning and the beseeches of all those Boleyns, men and women alike, was swept to her fate upon their greed and worldly desires. Some surroundeth me today in frightful quiet brooding of their violent thoughts reviewing of these her faults, and she yet staunch and stiff, proud to an end while suffering shame of such vile justices. I pray those with power to select this unnatural death be known to our Lord and punished with great casualty and spared the cloak of redemption for such unthoughtful and wrongful sin. As her Grace stood on that Tower platform, a new wood skeleton yet to be dark-stained by these griefs, she so white and small, the blood seeming to be drained all away before the blade had touched her simple neck. Thence turning to her small but mocking audience she spoke and was possessed of a calm interest in what lie so cruelly upon her, her hands composeth without a twitch of fear in clasp of a small object we none could see or know. Asking in a clear voice for memory of good intent and deeds and she profess to being always the loyal and firm subject of the King’s Majesty Henry her husband. Then how it was a strange and dark cloud passeth overhead with a sharp blast of cold air such that those with extreme campaign to her death looked up fearful, as if the Lord himself followed this judgement with displeased sanctions. Some fell to their knees in amazement and yet her Grace only lifted her eyes some bit but no part of her reckoned any change in posture. Now dearest Alice I pray you to remember my day some years ago of advising to Anne’s mistress of the wardrobe before her taking the title wife and Queen, whereupon I described in particular upon the importation and use of certain fine gold needles for the King’s broidery. Whose value it was learned later so that good lady found my counsel to wise use, and she in commending me to the Lady Anne so saying me to her, the news of good and earnest in my advise. Then I was called to her apartments and she already in royal state, greeting with a hearty smile as I bent to my knee, and did so reward me with a pretty present of a gold thimble with her crest upon it saying my advise causeth less weary hands of her ladies tasked in this small work. Recalling that event on this day, as I fell into the crowd of company near but not so near to catch the eye of the Queen, I turned when perceiving the swordsman swift ending of that lady’s breath to avoid witness of such sad event. I thence looked down to my trembling gloved hand upon that famous gold thimble, and recalled the kindness once shewn upon me and laid a vow upon my heart, amidst the crowds terrible silence that forecast the quick and final end. This vow good Alice, is that goodness must be our one message recalled and favored, for if one so lively and in privilege such as this Queen who is so now disposed, it can only be from the harbor of evil thoughts by others who are in easy forgetting of divers good service and all done in honest virtue. This I pray be a stance you may well consider with honour.